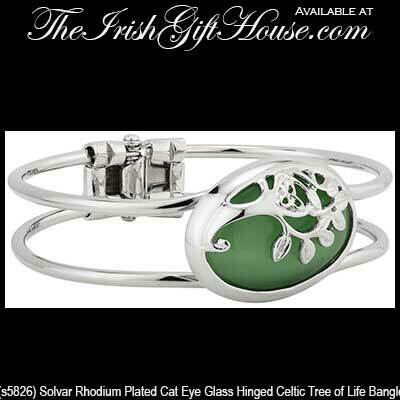 Tree of Life bracelet is a hinged bangle style design that features green cat eye glass along with a Trinity knot. Sorry, this tree of life bracelet is sold out. This rhodium plated tree of life bracelet features a Trinity knot and it is enhanced with green cat eye glass. The heavy weight hinged tree of life bangle measures 3/4" wide with a 1 1/4” long design; the one size fits most women's wrists. 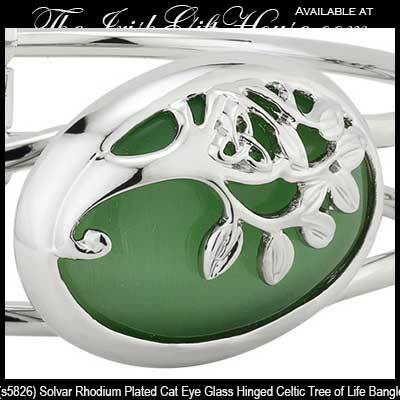 This piece from the Tara jewelry collection is gift boxed with Celtic knot and tree of life history cards that are compliments of The Irish Gift House and it is made by Solvar Jewelry in Dublin, Ireland.